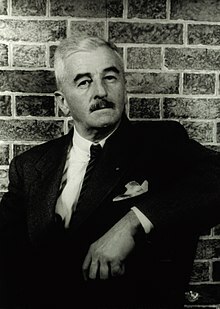 William Cuthbert Faulkner (September 25, 1897 – Julie 6, 1962) wis an American writer an Nobel Prize laureate frae Oxford, Mississippi. Faulkner wrote novelles, short stories, a play, poetry, essays, an screenplays. He is primarily kent for his novelles an short stories set in the feectional Yoknapatawpha Coonty, based on Lafayette Coonty, Mississippi, whaur he spent maist o his life. ↑ Obituary Variety, July 11, 1962. This page wis last eeditit on 26 Mairch 2017, at 15:56.